Take the hassle out of travelling to the Hampton Festival and take the FREE SHUTTLE. Enjoy a glass of wine or a craft beer or two without the worry of having to have a designated driver to get you home, no need to think about where to park either. Get dropped off and picked up right at the entrance to the Festival - all this and you’ll be helping our environment. Catch a FREE shuttle bus from Toowoomba, Northpoint, Highfields, Cabarlah or Crows Nest. 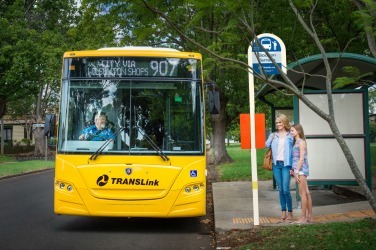 We are very pleased to announce that the Hampton Festival is partnering with Translink to offer a shuttle bus service from Toowoomba to the Hampton Festival this year. Pick up points will be at the Toowoomba Bus Station in Neil Street, Northpoint Shopping Centre bus stop in North Street, Highfields Village Shopping Centre bus stop and The Farmers Arms Hotel Cabarlah bus stop and you will be dropped off right at the Festival entrance. Outbound - departing Crows Nest Post Office - 10am - then picking up at the Caravan Park and the Motel. We are pleased to offer a bus service from Crows Nest to the Festival again this year. Range Charter Coaches are our Crows Nest bus partners and will pick up at the post office, caravan park and motel in Crows Nest. This is a free service. The bus will depart from the Post Office and also pick up at the Crows Nest Caravan Park and Crows Nest Motel.